A stigma is a mark of shame that’s associated with a particular circumstance, quality, or person. People who hold stigmas to others, often do so as a result of assumptions or stereotypes they believe to be true. Throughout history, sickness or illness has carried a certain stigma by people. Lung cancer, obesity, diabetes, and HPV are examples of illnesses or ailments that have been stereotyped and stigmatized. Why Do People Have Stigmas Around Mental Illness? Individuals suffering from mental illness have been portrayed as unstable or “crazy” by the media in the past. These labels have often been reinforced. Labeling a person with mental illness as “other” instills fear; fear of violence or fear of one’s own mental health. People hold many untrue beliefs around mental illness. Some people believe that individuals with mental illness can’t recover or believe that people can’t participate in their communities. Education and exposure to people living with mental illness can help to resolve these untrue beliefs. Often, people don’t take into account the environmental and hereditary circumstances that can facilitate mental illness and substance abuse. People may be blamed for their conditions or problem substance use and viewed as weak. Stigmas fall into the same category as prejudice and discrimination. Prejudice is when someone holds a negative attitude or belief about someone else because they are different in some way. Discrimination is when someone acts on this belief. Mental illness has had stigma, prejudice, and discrimination attached to it for centuries. Recently, scientific research and attention has been paid to a variety of mental illnesses. Society needs to overhaul their perception of mental illness and here’s why. Mental illness is widespread and dismissing or shaming the individuals who suffer from mental illness will not make the problem go away. It is only by shedding a light on the reality of the state of mental health that can instill real change. Judgement, shame, and isolation only work to aggravate symptoms of mental illness. If people are fearful of those suffering from mental health issues, social distancing can occur. Social distancing, will then isolate the individual living with illness. According to The Lethality of Loneliness loneliness can actually be deadly. The feelings of social rejection and disregard accelerate the deterioration of one’s mental health. If society believes mental illness is a excuse for poor behaviour (one of the leading stigmas identified in Canada), resources like medication and therapy will be less accessible for the mentally ill. In its “Attitudes Towards Mental Illness” report, the Centers for Disease Control (CDC) noted that stigma can result in a lower prioritization of public resources and poorer quality of care. 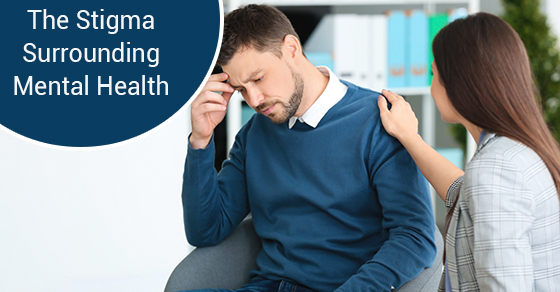 Only about 20% of adults with a diagnosable mental disorder or with a self-reported mental health condition saw a mental health provider in the previous year. The Centers for Disease Control (CDC) acknowledged that: “Embarrassment associated with accessing mental health services is one of the many barriers that cause people to hide their symptoms and to prevent them from getting necessary treatment for their mental illness symptoms”. If the general public stigmatizes treatment, the individuals that need treatment will be less inclined to seek it. Although mental illness is widespread in many countries, the stigmatization of mental illness corresponds with a lack of funding. This discrepancy is evident in the United Kingdom, where mental health accounts for 23 percent of the economic burden, but only receives 13 percent of the funding. Funding is necessary for progress in research and effective treatment. Mental illness takes a physical toll on sufferers and even leads to death. The highest mortality rate among psychiatric disorders is anorexia. - Anorexia is the most lethal psychiatric disorder, carrying a sixfold increased risk of death -- four times the death risk from major depression. Other deadly disorders include: schizophrenia, bipolar disorder, and major depression. Teaching people about mental illness and addiction in school systems will normalize it, help eradicate stigmas, and work toward comprehensive education programs. Other programs like “Bell Let’s Talk” share real stories about well-known figures suffering from mental illness and reveal how widespread mental illness is. Proper training can save lives. Training more people across the medical field in mental health issues creates the possibility of integrating mental health screening in primary care settings. People can also be trained to be aware of biases. According to Michael Friedman Ph.D., recent legislation holds promise that people with mental health issues will receive care comparable to those with physical health issues. For example, The Affordable Care Act of 2013 expanded upon the Mental Health Parity and Addiction Equity Act of 2008, providing more possibility that mental health conditions will be covered on par with physical health conditions. This legislation is an essential next step. Transformation doesn’t happen without demand and action. Making mental health and the mental well-being of citizens a priority will create a greater push for legislation changes, training, and the other needs of the mentally ill. Together we can recognize the importance of mental well-being and speak up.